For most people, talking about money, even with your children, is uncomfortable. Wealth and the transfer of wealth are areas that often are taboo to discuss, plan and prepare for. It is one of the toughest topics anyone can discuss well with their loved ones or business partners. Preparing in advance for life’s transitions and the transfer of wealth is critical to protecting your wealth. An estimated $30 trillion in wealth is expected to change hands in the U.S over the next generation among high net worth families, and women, who are the likely recipients, feel ill prepared. Preparedness is a challenge. Families are becoming increasingly complex and more diverse. Finances demand closer attention to changing tax, estate and family laws. Time seems too precious to dissipate with ongoing conflicts and arguments over money. But money is a central issue in all relationships. Transitions of Wealth Often Impact Relationships, Financial Status, Choices and Security! Chances are you have already experienced conflicts over money and your last argument could have possibly been over money. People argue how much they earn, spend, save, invest, or give away. Conflicts over money can occur for many reasons, beyond stresses on relationships, due to objective levels of economic hardship and transition. Money is a source of common conflict in marriages, and is the #1 Reason for Divorce. Whether planned or not, transitions trigger reassessment of your strengths and vulnerabilities. Learn seven essential steps to protect your wealth! Protecting wealth relies on proactive advocacy and tools to help you feel confident, secure and in control of your future after transition. We are well versed in family dynamics, financial strategies, investments, estate and tax rules, and solutions for overall wealth protection and preservation. Providing personalized training and support to help you evaluate and prepare your financial options. Formalized education programs to help prepare you and your family on how to deal with investments, wealth transfer and management. Make talking about money simple and to the point – we help you invest it to protect and grow your wealth. Reduce money conflicts in family conversations and also in the workplace. Resolve conflicts – we fearlessly dive into areas of conflict to support you in situations where most advisors dare not go. Save your from making financial mistakes that endanger your wealth and legacy – and guard against the trap of loss of wealth after transition or transfer. Bring financial clarity and precise content to all financial and legal actions. Untangle and resolve competing needs and interest as well as manage future expectations to create uniquely personalized solutions – far beyond just providing simple answers. Avoid missteps in court room clashes, estate battles or contested divorces. The Most Important Action You Can Take is to Engage Our Expertise. We have a strong reputation and extensive experience in wealth management, investments, estate planning, divorce, mediation, special needs, and litigation support. We are a trusted counselor and sought-after educator for individuals and businesses around the country. Lili A. Vasileff, The Wealth Protection Expert understands and facilitates conversations around diverse issues, challenging conflicts, and difficult decisions. She has over 30 years of wealth management and investment expertise. 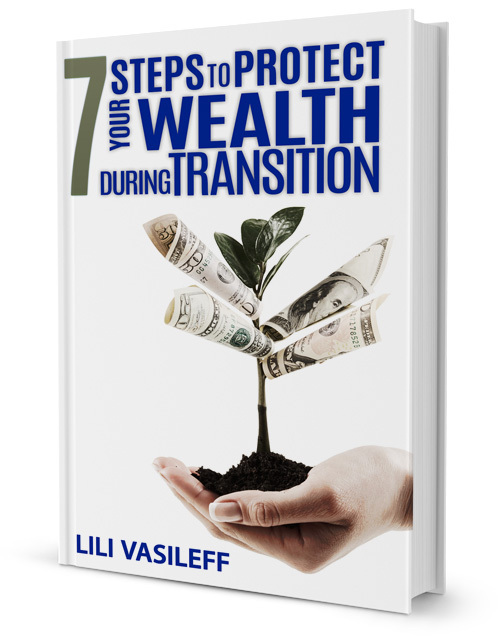 Subscribe to my newsletter and receive your free guidebook, 7 Steps to Protect Your Wealth During Transition. Copyright© 2019 Wealth Protection Management.